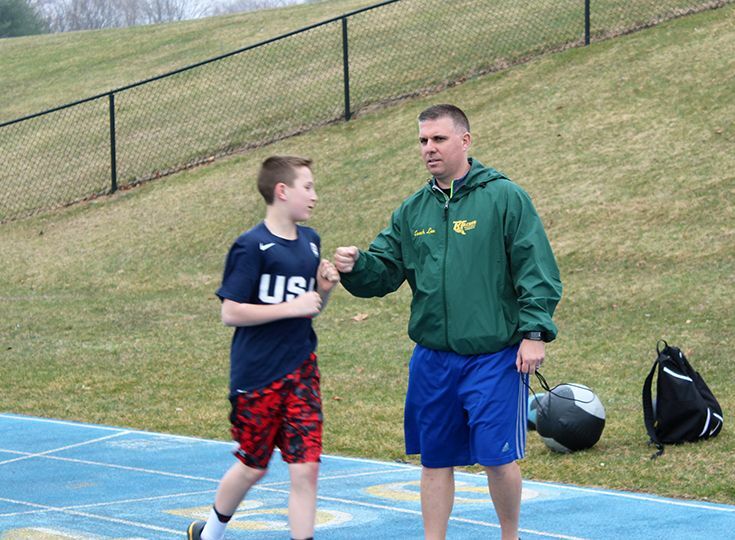 With spring sports just underway, we checked in with strength and conditioning coach Steve Leo to learn more about his role at Gill St. Bernard’s and how it benefits athletes over the course of a season. "Strength and conditioning differs from the training most people are familiar with," Leo explains. "Health and fitness are hugely important goals in and of themselves, but the training I provide goes beyond that to include sport-specific performance. Depending on the sport, athletes are looking for speed, flexibility and strength, and they want to learn how to move in a way that fatigue and injury are reduced over the long haul." Leo also notes that athletes wanting to compete at the college level will find strength and conditioning training invaluable. "College recruiters will be looking for that commitment," he says. "You want to be able to walk into a weight room and understand what you are doing and the goal of your training." To help athletes achieve these objectives, Leo works with Upper School teams and with individual players. His approach is never one-size-fits-all; every sport has a unique workout and each member of the team has different goals. He also varies training in response to the changing demands of the season, paying close attention to times when athletes may be particularly susceptible to injury. When there is an injury, or a potential for injury, Leo is able to coordinate an athlete’s recovery with the school’s certified athletic trainer Glen de Pino. "We are each complementing what the other person is doing,” says De Pino, “which helps prevent injuries and makes for faster recovery times when an injury does occur." Having worked with hundreds of athletes at the high school, collegiate and professional level, Leo has developed a sharp instinct for improving individual performance across a range of sports. He doesn’t rely on instinct alone, however, understanding that objective, quantifiable, data offers a more complete picture of an athlete and provides important feedback about the effectiveness of training. This winter, for example, Leo and varsity girls’ basketball coach Aaron Gratch arranged for physical therapist Joanna Goldin, P ’19, ’20 to work with the team on efficiency of movement. Goldin used Using dorsaVi wearable sensors, which pick up more information than can be seen with the naked eye, to analyze each of the player’s movements. After the analysis, she was able to help correct movements that could potentially lead to injury or strain. When she checked back with the team a few weeks later, she saw definite improvement. "Typically, strength and conditioning decline over a season," she says, "So making athletes aware of those movements that increase fatigue and can lead to strain proves very helpful over the long term." In addition to working with teams, Leo oversees a fitness option (an alternative to team sports) for students in grades 6-8. He works with those students every afternoon in an atmosphere characterized by high-energy and lots of movement. Although Leo shows the Middle School students how to create workouts and track their progress, his goals for the younger athletes are rarely sport-specific. "At this age," he says, "the best goals are overall fitness and wellness."